Clare aim to bounce back from their Munster final loss to Limerick. INJURIES TO DAVID McInerney and Aron Shanagher have contributed to Clare making three changes for Saturday’s All-Ireland senior hurling quarter-final against Tipperary in Páirc Uí Chaoimh. Defender McInerney is ruled out with a hamstring injury while attacker Shanagher is unavailable due to a chest problem. The duo both failed late fitness tests today. Oisin O’Brien also drops out of the Clare side to the bench. Joint managers Donal Moloney and Gerry O’Connor bring Cian Dillon, Jamie Shanahan and Aaron Cunningham into their starting side. Dillon, joint captain of the Banner last year, is selected at left corner-back with Shanahan, a hugely talented underage player who has been hampered by injuries, has been named at left half-back. Shanagher is replaced by his Wolfe Tones clubmate Aaron Cunningham, who scored a point when introduced in the Munster final loss to Cork, at full-forward. Jack Browne, Shane Golden and Ian Galvin are new additions to the substitutes from that defeat in Semple Stadium. Throw-in on Saturday afternoon is 3pm. Email “3 changes to Clare team for crunch quarter-final with Tipperary as Banner hit with injuries”. 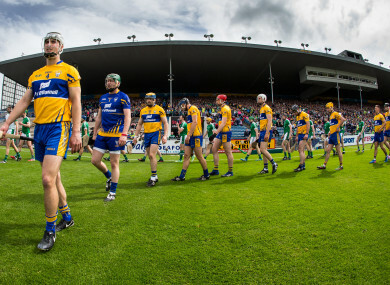 Feedback on “3 changes to Clare team for crunch quarter-final with Tipperary as Banner hit with injuries”.